Meditite in game: 2,692 Who? Important notice! 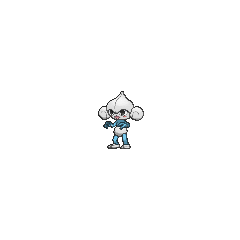 Pokemon Meditite is a fictional character of humans. Meditite made its debut appearance under the ownership of Shauna in A Meditite Fight. In Pokémon Ranger and the Temple of the Sea, Meditite and its evolved form, Medicham, worked for a traveling family of circus performers. The two Meditation Pokémon used Psychic to make balls of water retain their form. 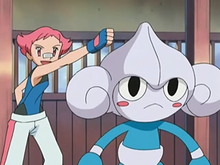 In Lost Leader Strategy!, it was revealed that Maylene used a Meditite in her Gym battle with Paul. Her Meditite also appeared again in Crossing the Battle Line! in a battle with Dawn, where it battled against her Buneary and won, then it battled against her Ambipom, where it lost. 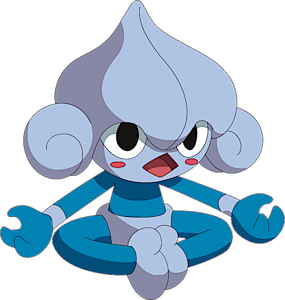 Meditite was also used to battle Ash in A Triple Fighting Chance!, where it managed to confuse his Chimchar and Staravia before losing to the latter. A Meditite appeared in the opening of Lucario and the Mystery of Mew. A Meditite is seen at the beach in Spontaneous Combusken!. In the Pokémon Adventures manga, Maylene has a Meditite that handily defeated Pearl's Chatot, who Platinum borrowed so she could battle her. A Meditite is seen in a flashback being defeated by Wallace's Clamperl during the Pokemon League in Chapter 251. 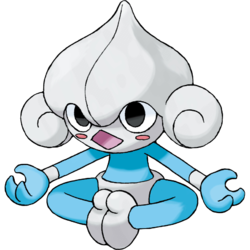 Meditite and its evolution are the only known Pokémon to have the Ability Pure Power. It was the last Pokémon for Who's That Pokémon? until the Best Wishes series. It resembles a primate of some sort. It appears to have been based on a practitioner of yoga and is meditating in almost all of the media it appears in. Its yoga position in its artwork and sprites is the Lotus, where one crosses his/her legs and places their feet on the opposing thighs. This position supposedly holds the mind completely steady for long periods of time and calms it, heightening the user's senses.